This is a tour if you want to know more about van gogh. You get to experience and see the vilage of Nuenen. See a small museum dedicated to Van gogh and show you what Van gogh painted during his short years living in Nuenen with his parents. 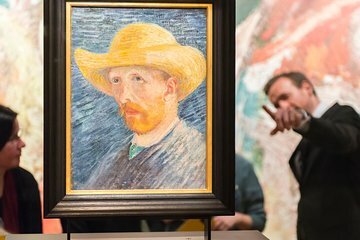 If you are a Van Gogh fan - you must go on this tour! It requires a 2-hour bus ride to get to the town of Nuenen but the ride was comfortable and it was interesting scenery. Once in Nuenen the local guide is a resident of the town. My guide was very knowledgeable about Van Gogh's history in the small village. Much of it looks exactly as it was when Van Gogh lived there and many of the actual structures are still standing and look exactly the same. In fact fans will recognize the structures from many of his paintings. What a treat for a Van Gogh fan to literally walk in his footsteps, see what he saw and see what scenes inspired him. The small museum there is also well worth a look. Newly available to tour is the house next to the Parsonage where Van Gogh lived with his parents. It was the house of the woman with whom Van Gogh had a brief relationship during his 2 years in the town. The house is restored to what it would have looked like during the affair and it was a real treat to experience this peek into Van Gogh's life. This tour is highly recommended for those who want to go beyond the fabulous Van Gogh Museum in Amsterdam.